We recommend renting a GPS. Very few roads are marked and there are no real addresses in Costa Rica. We also recommend arriving before 5:00 PM on your first night to get your bearings, as it does get quite dark. Take the Inter-American Hwy 1 NW to San Ramon. At San Ramon take the highway north in the direction of La Tigra. 3.4 km later turn left at the “Y” in the direction of Arenal. 3.9 km later you pass Los Angeles Sur. 33.4 km later turn left at the “Y” in Bajos Rodriguez. 9.3 km later turn left (to the right is La Tigra). 3.8 km later turn right at the “T” in the direction of La Fortuna. .9 km later cross the Rio Penas Blancas on a high bridge. 2.1 km later pass San Isidro. 4.4 km later pass Chachagua. 13.4 km later you are in La Fortuna. Continue in the direction of Nuevo Arenal. 14.3 km later you pass the road to the Arenal volcano; continue straight. Note: If you have any valuables visible in your vehicle, be sure to park in a secure location if you stop for a meal or sightseeing. 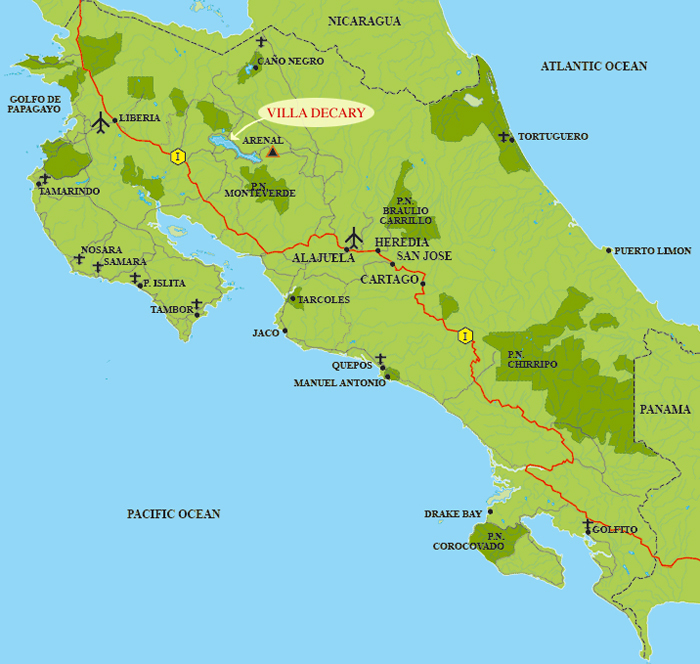 Hotel Villa Decary is 44 km from La Fortuna on Route 142. From La Fortuna, travel west in the direction of Tabacon, Nuevo Arenal and Tilaran. When you first see the lake, the road continues across the causeway of the dam and becomes the main lake road. Villa Decary is about a 30 minute drive from the dam on the main lake road. We are around the bend from a small shopping and restaurant plaza called The Falls with signs for Tycoon Art Gallery, Lajas Restaurant, UPS and Century 21. 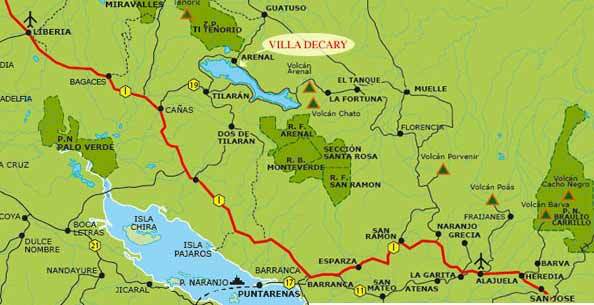 Though you can't see the hotel from the road, look for the Villa Decary sign on your right and turn into our driveway up the hill to the hotel. If you pass The Gingerbread restaurant, you have gone about .1 km too far. Exit the Liberia Airport, turn left onto Route 21 and drive 10 minutes to the main intersection (the only overhead traffic signal). Turn right onto Inter-American Highway (Route 1). Drive for about 45 minutes to the lime green and yellow two-story bullring at CAÑAS and turn left. Follow the signs for TILARÁN. At the "T" in the road (57.1 km), turn left onto Route 142. At this point, the rest of the trip will be on curvy, winding roads. At the next fork in the road stay to the right (there is a sign here indicating the Mystica Hotel to the left). You will pass a small blue and white bus shelter marked “Colono.” Continue on the lake road. After an hour’s drive from Canas you will drive up a hill to the town of Nuevo Arenal. Continue straight and down the hill (gas station on your right). At the “T” at the bottom of the hill are many signs. Turn left and drive along the lake road 2 km to the Villa Decary. The Villa Decary is shortly after The Gingerbread restaurant, on the left. The road narrows in front of our property, and you’ll slow because of a “Ceda” sign. There is a white fence running along the front of the Villa Decary’s property. Turn left up our driveway. If you miss our driveway, you'll come to a little cluster of businesses: Lajas Restaurant, UPS, Tycoon, Century 21. Turn around and come back to us.